In today's card, I used the mini stamps that I got from Sarah's kit previously. 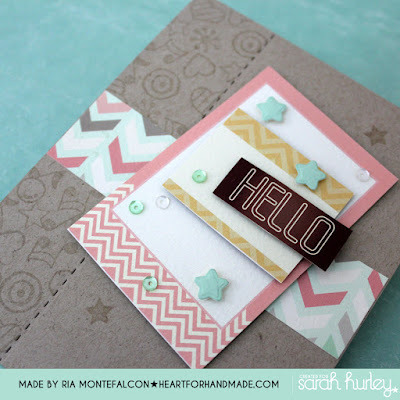 I specially love the small shapes that one can easily use to create patterns which I did here on the side of the card. I stamped the shapes randomly to fill one area of the card base. I then added a stitched accent by using a die cut shape with only stitching lines. You can also do a different variant of the mini stamping by using different colors of ink in white cardstock, that would also look great. My 'Hello' sentiment is from one of Sarah's Snip n Stick embellishment sheet while the papers are a from random ones from Sarah's scrapbooking kits. I added some die cut stars and sequins to add texture on my card. And this is the full card..
As usual Ria it's elegant and beautiful. Love the Kraft base it really shows off the toppers.